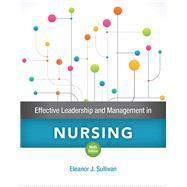 For courses in nursing leadership and management in programs, including baccalaureate degrees in generic and BSN completion, and graduate-level nursing programs. Pearson eText offers a simple-to-use, mobile, personalized reading experience that lets instructors connect with and motivate students – right in their eTextbook. Note: You are purchasing a standalone product. Students, if interested in purchasing this title with MyLab, or via Pearson eText, ask your instructor to confirm the correct ISBN and Course ID. Instructors, contact your Pearson representative for more information.